Syria: Will the bayonets fall? Judging according to the latest reports from Damascus, there is already a military operation conducted in the north of the Syrian capital since some days. In the entire area from Harasta to Duma, the Syrian Arab army takes the rebel gangs under heavy fire. A maximum concentration of the rebels, who were waiting in order to carry out the next “storm on Damascus”, were intercepted and then they were put in a preventive strike under fire. The preventive strike is certainly necessary, but, as one can see in Daraya, the eradicating of the terror brigades who have entrenched themselves in the urban terrain can last for months. On various Internet nodes of the rebels, one was already able to read that commanders of the rebels have signed up for the victory celebration at the presidential palace a week ago. Now, they can probably put the invitations to their sure extensive collection of souvenirs. In Damascus itself, there are problems with the power supply, probably as a result of this situation. Hard to say whether this is a result of the fighting or whether the army command targeted paralyzes the communication – similar like it has happened in the end of last November at the times of the planned second “volcano”. The people of ANNA News will sure comment this on one way or another. They even managed it at the end of November / beginning of December, to broadcast their updates by satellite to Moscow, from where the updates then appeared on their YouTube channel. As a blog, which has not necessarily to take the responsibility for the genuineness and authenticity of information, we are able here on the blog now and then, to even take care about some unverifiable information. The information is not verifiable, but this does not matter – the event was in the past. About a year ago during the escalation in Homs, a concrete agreement was made between certain echelons in Syria and Russia (not on the highest hierarchy, but still quite high in the hierarchy) – it was agreed on, that with the next flight from Moscow to Damascus, a half a dozen of groups of three, mainly specific professionals, will enter Syria without a great stir and then move to Homs. The plan was simple: 100 heads per the groups of three. Accomplish it, make report and then leave the country without any pomp again. It already had started with the execution: the equipment was fetched, the relevant experts (which had no meaningful tattoos or other identifying features, of course), were engaged, but in the last moment, somebody in the senior Russian Cabinet, to say it least, has pissed in his pants and countermanded the action. At the time, around 2,000 rebels were entrenched in Homs. This action would have been able to end the whole process there quite different. This whimsical and certainly entirely implausible story should draw our attention at something. At present, the West, the Gulf monarchies and al-Qaeda are testing and conducting a war in Syria by entirely novel technologies. Outwardly, it looks like the wars of previous decades, of course, partisan wars, industrial war, special operations, but it is difficult to deny, that the current conflict in Syria is significantly different to everything that took place before. This refers to the stakes and the costs of this war. Based on the messages about the “wage” for a rebel – monthly 300 to 500 U.S. dollars – as well as the possible “production rate” of the training camps in Jordan, Lebanon, Turkey, Libya, and Egypt (yes, also in Egypt!) – i.e. about 1,000 units of human resources per month per training camp (?) – one comes to the result (rule of thumb estimate) that about $ 5 million USD have to be paid monthly, plus the material from old weapons stocks from Eastern and South-eastern Europe (Croatia was once in the news) and the countries which were devastated by the “Arab Spring”. Of course, in addition to all the logistics and infrastructure in the training camps. But as high one estimates the sum based on the facts, it is still negligible compared to the costs of the “conventional” warfare, and that with a similar destructive effect which the aggressors reach in Syria. 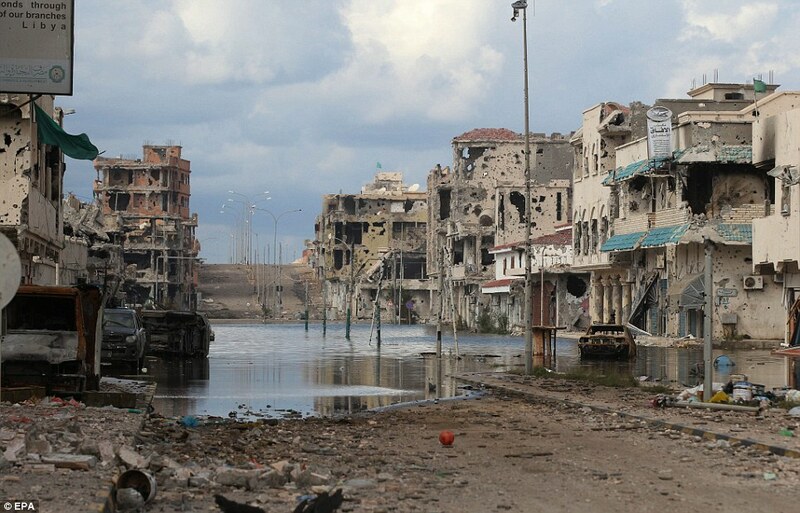 Just look at Daraya (frequently to see in the YouTube channel of ANNA-News); the memorable image from Sirte, which ended as a symbol of the devastation caused by NATO in 2011 and whose rebels skirted around the world, is almost to declare as idyllic – compared to Daraya. Western countries (Jörg might call them differently), the Gulf monarchies and “Al-Qaeda” test, probe and perfect the cooperation structures, role allocations and logistics. These structures only get more effective and better with time. This would actually be the target for retaliation. Not so much or so primarily the manufactured bandits of the Al Nusra front or the Liwa al-Islam, these are crushed by the Syrian army tedious but effective. But this massive, effective and yet so economical logistics and infrastructure of the aggressors. In due time, the German Empire was not able to destroy the production of tanks and fighter planes by the Soviets because their production was unceremoniously shifted out of reach, so the Germans were forced to fight against finished tanks and air force, which became more and more. The outcome is well known. The destruction of rebel forces is just the tip of the iceberg of tasks for the Syrian government and the civilized world. Even if the destruction of the rebels, as now, is carried out on an industrial scale and monthly about 5-7 thousand bandits are liquidated, this will only cause the aggressors to make their machinery of mobilization and war logistics more efficient and to establish more training camps, while the Sheiks from the Gulf will invest 30-50 million dollars instead of the previous 10-15 million dollars. In terms of human resources, one can look at the current situation in Egypt – just one of the countries of the “Arab Spring”, albeit a key country. Egypt has about 85 million inhabitants and is about to collapse. When Gamal Abdel Nasser has ruled in Egypt, it was only a quarter of today’s population, which provides information about the age structure of the Egyptian population. In German: millions of fairly young, energetic starvelings. The time to react at this level has long since come. It takes counter technologies, experts of various professions, as well as Russians, Syrians, Iranians, White Russians – from all of the countries which are the next targets after Syria. It takes people in Syria who would be able to oppose the dismantling technologies of the aggressors. And these people would need to have all the equipment which they do need for this job: if it must be snipers, they should get them. If they need units for special operations, they must get them. If they need hackers, they must be provided with them. Certainly, there are certain foundations, also in every game without rules. Also in the war against Syria, they stick to it: the aggressors deliver any kind of help and support to the terrorist gangs, but they do not directly and officially participate in the war. This means, that such a rule must also be applied to the countermeasures, otherwise, there will be a completely symmetrical response that none of the countries of the – let’s call it this way: Resistance – can afford. The conclusion, from whose context is also the title of this text: The situation in Syria is developing so that we are now almost in all details again in the same situation as 80 years ago in the Spanish Civil War. The task of supporters of Syria is to train professionals, instructors and counsellors and to send them to Syria, and to provide them with any kind of tools which are available and what they need – equipment, personnel, infrastructure, know-how – but which formally then have nothing to do with the governments of the friendly nations. If it were necessary, they shall also get some private nuclear submarines in order to sink a couple of freighters with deliveries of weapons and personnel of the “rebels”. Yes, that would be piracy, and I am sure that Russia and the others will sharply condemn such a fact in the UN Security and they will help the world public in combating this evil. Whether one likes it or not, one must admit that the “point of no return” has long since passed. Actually there is no choice: the supporters of Syria will have to tackle these problems as well in some years. Then even closer to their own territory or in their country. But they should tackle it now, after the countermeasures were created, tested and established – instead of making some feverish thoughts on how to trench rebels who have entrenched themselves in a suburb of Moscow or Tehran. the fact that the gulf despots are behind a lot of the finance and supply of weapons, Syria should take a leaf out of one of Vietnams tactics when fighting the french and usa. attack when they least expect it and retreat before they can counter attack. also try to stop the flow of oil from gulf despots that will stop the flow of money to the usa, zionist backed terrorists. GOOD LUCK. and best wishes. Excellent article! There must have been a secret deal reached between USA and Russia behind a closed door. Russia and Iran are more responsible for what is going to happen to Syrian people than NATO and USA since they are so called "allies" of Syria. Iran is bragging of being a regional power busting their trade with the Turkish Muslim Brotherhood an arch enemy of the Syrian and Turkish people alike. There is a lot of hypocrisy going on while innocent Syrian people are tortured, raped and eventually killed in cold blood in the name of God. However the time of God's visitation is nearing when Christ will destroy those who have destroyed the Earth. Dear Syrian people a precious purchase of God do not be afraid of those who can only destroy this mortal body and do nothing more. Christ has said "I'm resurrection and life who believes in me even if he dies he shall live again". My earnest prayers for you have been always before my Lord Jesus Christ since the beginning of this terrible conflict. It's better a grave than to be a slave. God be with you all in your suffering. Your blood has not been shad in vain. Sorry for my English I had to post it again. Excellent article! There must have been a secret deal reached between USA and Russia behind a closed door. Russia and Iran are more responsible for what is going to happen to Syrian people than NATO and USA since they are so called “allies” of Syria. Iran is bragging of being a regional power boosting their trade with the Turkish Muslim Brotherhood an arch enemy of the Syrian and Turkish people alike. There is a lot of hypocrisy going on while innocent Syrian people are tortured, raped and eventually killed in cold blood in the name of God. However the time of God’s visitation is nearing when Christ will destroy those who have destroyed the Earth. Dear Syrian people a precious purchase of God do not be afraid of those who can only destroy this mortal body and do nothing more. Christ has said “I’m resurrection and life who believes in me even if he dies he shall live again”. My earnest prayers for you have been always before my Lord Jesus Christ since the beginning of this terrible conflict. It’s better a grave than to be a slave. God be with you all in your suffering. Your blood has not been shed in vain.